Home Life A New Car!? We didn’t get a new car. As of today, we still have four cars… soon to be three, though. The Toyota Tacoma has been driven maybe five times in the past six months so we’re passing it on to a member of the family who’ll actually get some good use out of it. Don’t get me wrong, it’s been great having a pick-up truck in our fleet. Being able to pick up furniture and appliances on our own schedule is really really convenient. And dump runs? Well, we’ve put some pretty horrid things in the bed of that truck that I’d never ever never consider putting inside one of our other cars. Those days are now over. In the end, we won’t have an extra car clogging up the driveway and we’ll save a few bucks on insurance and property taxes. All-in-all, giving the truck away is a good thing. So that leaves us with the Land Rover Discovery, the Scion xA, and the super impractical BMW Z3. Two drivers and three cars. And now we want to get a new car. Notice that I said “new” car instead of “another” car. The Land Rover is older… but has fewer miles on it. And the Land Rover is bigger than the Scion… but only takes premium gas and with a V8, well, it drinks a lot. Basically, the cars kinda cancel one another out. The Scion’s negative is that it’s really small. We can get all four of us in it, comfortably, but that’s it. The biggest downside is that it’s a four-wheel drive V8 that takes premium gas only. That means it costs me between $85-$100 to fill up every 10 days or so. That said, I feel “safer” in the Land Rover than I do in the Scion. Had that most recent fender bender been in the Scion, well, first off, it would have been totaled but secondly, I think I’d have “felt” it. So the plan is to trade one of them in and buy a used minivan where the kids will each get their own seating row. And that’s why, right now anyway, it feels like we should trade the Scion in. Another factor is that it’ll probably be worth more as a trade-in than the Land Rover. I know that sounds crazy — they’re only one model year apart with a MSRP difference of $30k — but how many folks out there want a 10 year old gas guzzler? 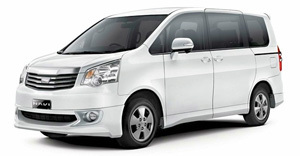 So, regardless of which car we trade in, the plan is to get either a Toyota Sienna or Honda Odyssey. My wife and I both prefer the Sienna — I hate the name but can’t argue with the longevity and reliability of a Toyota (based on the Tacoma and the Scion). Yep, we’re right back to where we were two years ago. The tough part is that we (still) can’t really afford (or maybe we just don’t want to have to pay for) a new or used car.